Larger Quantities: The table above includes quantities up to 1,000 cups but when ordering you will see the pricing for up to 2,500 cups. If you need more than 2,500 please contact us for special pricing. Price Includes a one-color 5 oz. Plastic Wine Cup with 2 lines of personalization including the design. The base of this cup is detachable. You may print on both sides of this cup for no additional charge. Lids are not available for this item. Additional Line Charge: Because of the small imprint area on this item, you cannot have additional lines of copy. 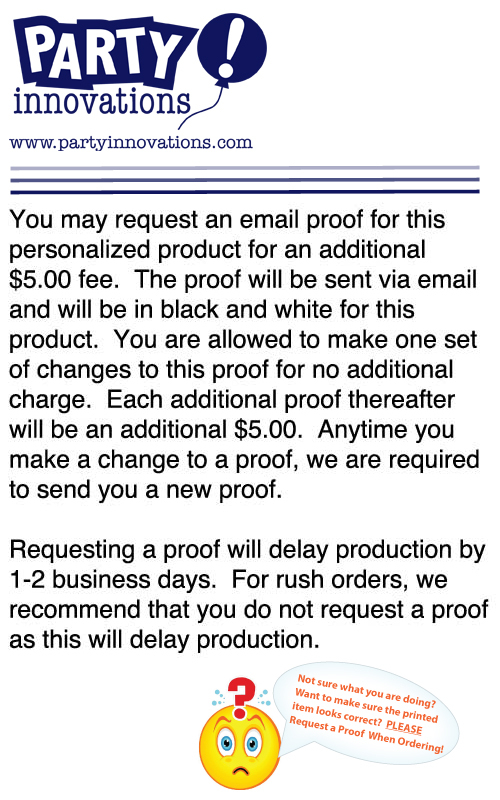 Email Proof Charge: This product includes the option to receive an email proof prior to printing for an additional fee of $5.00. The proof will be sent via email and will be in black and white. You may make one set of changes to the proof for no additional charge. Each additional proof thereafter will cost an additional $5.00. Any time you make changes to a proof, we are required to send you a new proof. Rush Orders: For production time and rush options please refer to the production and shipping section for this product. If you cannot locate this information please contact us. 2-Color Imprint: We are able to print 2 imprint colors on this item. Please contact us for pricing for this service. Color Change : Changing the color of the imprint will incur a fee of $20 per change and can only be done when ordering increments of 50 per imprint color. To request a special color assortment, please include this information in the special instructions field when checking out or please contact us and we will help you set this up. Custom Artwork: If you would like to use your own artwork on this item, you will need to place your order from our Corporate Logo section. If you need assistance locating the product in this section please contact us. Change Charge: Changes made to your order after it has been entered into production may incur a minimum $7.50 change-charge. If the order has already been printed, you may be liable for the total amount of the order. Packaging: This item is normally packed in sleeves of 25, though this may not always be the case. For specific information on how this item will be packaged, dimension, and the weight of the package please contact us. If you have special packaging requirements please contact us for packaging options and pricing. Gift Enclosure Card: We can include a gift enclosure card if requested. Please contact us for information and pricing. Alternatively, at no additional charge, you can also include gift information on packing slip. If you would like this option, please add the gift message in the special instructions field when checking out and that message will appear on the packing slip that the recepient receives. There are no prices on the packing slip. Invoices will never be in the box unless shipped overseas. Unprinted Plastic Wine Cups: We offer this item without any printing at a discounted rate. If you are not able to find this item on our website please contact us and we can assist you in ordering it. Great Cups for Wine & Champagne - Let's Toast! Print on 1 Side or 2 Sides - No additional charge! Print up to 2 lines of copy including a design. Over 100 typestyles/fonts to choose from! Over 40 imprint colors to choose from! Top of Cup: 2-5/8" | Height of Cup: 4-1/2" | Base of Cup: 2-5/8"
*If you have a design idea that you would like to use but do not see it in the design options please contact us for other designs that may be available. 5 business days for production. If you request an email proof, please allow an additional 2-3 business days for production. A delay in approving your proof will further delay production. Please try to approve your proof as soon as you receive it. Also make sure that our emails are not going into your spam folder so that you do not miss the proof. View shipping time to your location and rush options. Please note that expediting the shipping method will not speed up production, it will only affect the shipping time for the order.